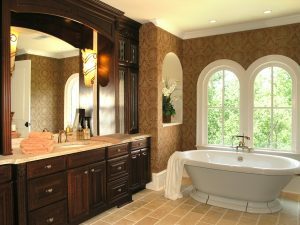 Your bathroom is where you go to get ready before work, as well as the place where you may unwind at the end of a long day. The space should be comforting and relaxing, and the lighting design goes a long way in accomplishing that ambiance. When it comes to bathroom lighting, brightness, control, and layering are all very important, and the experts at Hacienda Lighting can help you with all three through the right general, task, and accent fixtures. The general, or ambient, light fixture in your bathroom shouldn’t be too large, as you want it to provide enough light for the entire room, but not be too bright or overwhelming within the space. A flush or semi-flush fixture can be a great option here. You won’t be relying on this fixture for task or accent lighting, and it just needs to fit the design and dimensions of the room. Perhaps the most important lighting in your bathroom is the task lighting. You don’t want only an overhead light on when shaving or putting on makeup, and this is where vanity lights and sconces prove ideal. With lights just above or on either side of your bathroom mirror, you’ll be able to easily see when using your razor or applying mascara. For accent lighting, consider adding track lighting that accentuates the architecture of the room or highlights a piece of artwork. When looking for new bathroom lighting, it’s important to do your research in order to find the right size and style, and the team at Hacienda would love to assist you. Contact Us Today! Shop Online Now!